Merengada, modelled on bands from Santo Domingo, with crazy singers and a hi-energy girl sax player, this non-stop show will leave you breathless and ecstatic! Launched to international fame by their Top 10 Latin chart hit, a Salsa version of Marley’s “No Woman No Cry”, this stunning London based international band continue to wow Europe. Playing original Salsa and energetic Merengue music, and Bachata too, Merengada transport their audiences to the dance-halls of Cuba and the Caribbean. Salsa originates in Latin America, and crazy Carnival-style Merengue and more lyrical Bachata (reminiscent of African shores) come from the Dominican Republic; the resulting heady cocktail is an authentic pot-pourri of lively dance music, complete with singers, fiery brass, storming percussion and slick choreography. 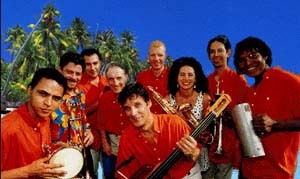 With a line-up of two Dominicans, a Mexican, an Italian and six top British musicians (two singers, three brass, three percussion, piano and bass) this band has created their own identity and repertoire with some classic songs and many of their own salsa, merengue and bachata compositions, some of which have been used on television (Carlton TV and Channel 4). In 2001 they were commissioned by BBC TV to write a salsa song specially for the film “Babyfather” and hey were featured playing the number on screen. Come and see why they regularly amaze thousands of European festival-goers! !